You can't rename or move a Personal Folders .pst file while Microsoft Outlook is running or through the properties for the PST file in either Tools | Services or Outlook Today. If you are using Outlook 2003 and newer, we recommend going into Control Panel, Mail and pointing Outlook to the moved .pst instead of waiting for Outlook to prompt you to locate the moved .pst. See New Method for details. This method can be used for POP3 or IMAP accounts, as well as SharePoint and Subscribed Calendar data files. Select the account and click Open File Location to open the folder containing the PST in Windows Explorer. Reopen the Data Files window and double click on the account's data file. Now you'll get a 'can't find data file' error message, like this: The file C:\Users\username\Documents\Outlook Files\email@domain.com - email@domain.com (POP3).pst cannot be found. After you click Ok, you can show Outlook where to find it. Don't forget to check your Rules Wizard rules to make sure they're still moving data into the right folders. This video tutorial shows how to move a pst file. I'm using Outlook 2016 and Windows 10 but the steps are similar for Outlook 2007 and newer and Windows 7 and newer. If you have multiple Outlook profiles, you'll need to select the correct profile. Open the Mail dialog in Control panel, click Profiles and double click on the desired Profile, then click Data Files. Continue with Step 2 above. Restart Outlook. When you're prompted for the location of the now-missing PST file, point to the file in its new location. If mail is being delivered to a pst you moved or renamed, go to File, Account Settings and select the account that uses the pst. Verify the correct pst is listed next to the Change Folder button. Note: this method only works with POP3 or standalone PST files. 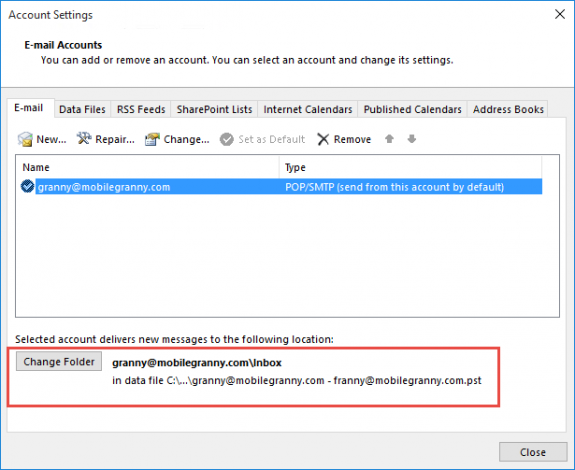 See How to move the IMAP personal folder (*.pst) if you need to move an IMAP or SharePoint PST files. Files used by the Outlook Connector cannot be moved using these methods. It is possible to repoint the folder or file using symbolic links or junction points. You could also use a registry hack to move the user profile folder (this will affect all files in the user profile). For more information, see Symbolic Links (MSDN), Junction Points (MSDN), and How to Move Shell Folders (and contents). If you try to locate a PST file with Start | Find on a Windows system, you need to be aware that Windows treats PST files as hidden files. In Windows Explorer, use Tools | Folder Options | View to make sure that hidden files are shown. You need to check your Rules Wizard rules to make sure they're still moving data into the right folders. Diane there is a problem with your (new) procedure - for Outlook 2007 at least. The problem is step 3, where you say 'Close the Account Settings dialog'. The problem is that when you later re-open this dialog after moving the pst file, Outlook just creates a new (blank) pst file in the original location. This seems to be the problem many people are experiencing. The solution is easy - leave the Data files dialog open! Now when you double-click on the relevant file (after having moved it to the new location), you get the desired 'pst file cannot be found' dialog, followed by the opportunity to browse for it in the new location. There was a reason why it needed to be closed - i believe it kept a lock on the pst if the dialog was open, but forget because I haven't tried it in a long time... if that is no longer a problem (or you move the pst before opening the dialog), then it doesn't need to be closed. I'll boot up a virtual machine and test it. Hi Diane, I think there may be some confusion over which dialog needs to be closed. After further testing I established that (in Outlook 2007) if you carry out the extra step of double-clicking on a pst listed under the 'Account Settings>Data Files' dialog *before* moving it (not part of the normal process), then the additional properties dialog that opens (headed 'Personal Folders') does indeed put a lock on that pst, however the Data Files dialog by itself doesn't put a lock on it. To recap then, I found that the only way to provoke the necessary 'pst file cannot be found' dialog (which is essential for allowing you to tell Outlook where you have moved it to) was to leave the 'Account Settings>Data Files' dialog open whilst moving the file, otherwise (if closed first) it just creates a new (blank) pst when re-opened instead of complaining it can't find it. I hope this makes sense. Thanks for a great site by the way - my first port of call for any Outlook issues! I also found the written instructions did not work as intended for 2007. However, the video process, which is different, does work. Instead of double clicking the data file in step five, click settings for that data file. Then the pop up window asking for the location of the file appears and the process works as intended. I recommend changing the written portion (step 5) of the instructions to match what the video shows. Thank you but I have a couple of questions: old computer is Win/10 running Outlook 2007. New computer is also running Win/10 but Outlook via Office 365. The new one has Outlook set up and running but of course does not have all old items... Contacts did sync via iCloud but the same as on the old. now have a week or two of new email on the new computer and want to bring in all the old email and contact lists... have multiple email accounts and I do not want to have any effect to the new items on the new computer but sill add all the older items from the old. I have found the .PST file and have it on "Thumbdrive". What next and will the new get lost if I bring in the old? Hi - I messaged this site once before but I cannpot find the thread anywhere. I moved my Microsoft Outlook folder (with the PST file in it), But without using either the new or the old method - because Im an absolute prize idiot. When I right click the PST file its properties only show 58mb which suggests to me there's now nothing in it? Now when I go to my email account in Outlook - all the sub folders I created have vanished. Only the trash, spam and deleted folders remain. Im getting very lost with all the advice, please please tell me I have just broken the link or patha or explain what has happened and how it can be solved - if at all !!! I have a POP3 webmail account thatr I added to Outlook. Once I moved it, I noticed the outlook data.pst file became duplicated sitting in two locations. So I deleted newly located one, reverting back to the original file in my documents. However, When I then when to Outlook to check my email, all the folders have disappeared, presenting me with just the default folders (junk, deleted, sent, inbox). How can I open the PST file? I have read the whole thread but I dont think anyone has been quite as stupid as I have!!! I have also same issue. I did this procedure, I moved all .pst files to new location. When I try to open Outlook, it generate the same files automatically without any message or alert !!! what was wrong? How do I move "My Documents" folder (Windows 7) to another drive on the same computer from the C default drive leaving Outlook 2013 in its default place? When I do this using the built in properties/location/move/destination dialogue for redirecting personal system folders - all works super great EXCEPT Outlook 2013 no longer works - even when I have otherwise changed the Outlook file location in settings - Error Msg = Outlook Data File.pst path specified is not valid which still remains the old default C:\Users\...\Documents\Outlook Files\ path. So it would seem easier just to leave Outlook as is in it's default location - I have tried to re-direct Outlook after using the "move" folder location function in Windows 7 but have not been successful. Reason is to free up space on a 256GB SSD C drive by moving "stuff" to a secondary 1TB HDD. You can move pst files. Moving ost files (imap, exchange, outlook.com) is a bit more effort but can be done. Which error message did you get? The recieved date shouldn't change, but the modified date changes to the date of the move.